Selection from a phage library of 109 members displaying hIL-2 with controlled diversity at the IL-2R alpha subunit interface (see Supplementary Table S1 for library design) on immobilized human CD25 rendered phage mixtures with growing reactivity to the selector molecule (Supplementary Fig. S1a). Sequencing of a sample of 30 clones from the fourth panning round output revealed the presence of clones displaying wild-type (wt) hIL-2 (23%), variants with several mutations in the segment 61–74 (mainly V69A/Q74P, 67%), and single-mutated variants (K35E or K35Q,10%). Selection on mouse CD25 (Supplementary Fig. S1b) only rendered recurrent changes at position 35 (K35E, K35Q, or K35D, 13% of 30 additional clones from this panning). As V69A/Q74P increase the affinity of hIL-2 towards human CD2532 and not to its mouse counterpart12, the appearance of changes in the region 61–74 was readily understood. Mutations at position 35 were unexpected because theoretical diversity at this position only included the original K and the conservative replacement K35R due to the postulated involvement of this residue in forming ionic bonds with CD25, being any other change the consequence of library construction errors (during mutagenic oligonucleotide synthesis or DNA polymerization). A sample of clones (30) from the unselected library (all able to display hIL-2 as judged by reactivity with anti-tag Myc1–9E10 mAb recognizing the c-myc tag fused to the displayed proteins) was used to evaluate any possible bias in the original library diversity at position 35. While the presence of two clones with undesired changes at position 35 (K35T) provided actual evidence for the existence of library construction errors, most clones had sequences corresponding to the theoretical library design, even at that position, ruling out gross library construction mistakes. Over-representation of E, Q and D at position 35 was not found, seeming to be an actual selection-driven feature. Even knowing that the library contains errors and these undesired changes could in principle be selected if they confer a binding advantage to the selector target, the emergence of charge reversal mutations at position 35 upon selection on CD25 was surprising. The positively charged K35 has been postulated to form an ionic bond with E1 from the human alpha IL-2R subunit, on the basis of the known crystal structure of the complex4. Non-conservative replacements at this position are thus supposed to result in a weaker interaction with CD25, not the other way around. Further experiments were then aimed at deciphering the driving forces behind this enrichment. Replacements at position 35 resulted in a remarkable increase in the display levels of hIL-2, as determined by phage enzyme-linked immunosorbent assay (ELISA) on immobilized Myc1–9E10 mAb (Fig. 1a). Charge inversion replacements (K35E, K35D) had higher influence than K35Q, while the conservative substitution K35R had no effect. K35E -the mutation most frequently selected during panning- was chosen for further experiments. Display levels of a variety of IL-2-derived muteins already described10,11,14,32 containing K35E were also increased by 6-30-fold. K35E not only improved the levels, but also increased the antigenicity (measured with several anti-IL-2 mAbs) and receptor binding ability (to human and mouse CD25) to different extents (Fig. 1b). This was in sharp contrast to the specific increase in binding to human CD25 observed for the already described V69A/Q74P IL-2R alpha subunit super-binder32. The improved binding to multiple partners recognizing different epitopes of native hIL-2, particularly to IL-2.2 mAb that recognizes the segment E99-M104 located far from the region targeted in the library29, provided a first indication that the observed improvement is a result of a global effect of K35E on folding of the displayed protein. Effect of mutations at position 35 on IL-2-derived proteins displayed on filamentous phages. Display levels of mutated hIL-2 variants were evaluated by ELISA (a). Equivalent amounts of phage particles (as determined by viral titration) were incubated on polyvinyl chloride microplates coated with the anti-c-myc-tag mAb Myc1-9E10 that recognizes proteins fused to PIII. Bound phages were detected with an anti-M13 mAb conjugated to horseradish peroxidase. Phages displaying non-mutated hIL-2 were used as reference. The quality of the displayed proteins was evaluated in a second ELISA (b). Phages carrying either non-mutated hIL-2, or hIL-2 containing K35E replacement or the double mutation V69A/Q74P, were diluted to reach similar levels of the displayed proteins (according to Myc1-9E10 reactivity in the previous experiment) and incubated on microplates coated with several anti-IL-2 monoclonal antibodies and CD25 (human/mouse). Bound phages were detected as described in (a). Parallel production and ELISA evaluation of phages displaying each variant were independently repeated three times to assess reproducibility of the differences. The evaluation of a representative phage production experiment is shown in each panel. Samples were evaluated by triplicate on ELISA plates. The introduction of K35E resulted in an enhanced secretion of IL-2/human Fc fusion proteins after transient transfection of Expi293 cells. This was shown by both SDS/PAGE under reducing conditions and ELISA. The appearance of an intense band with the expected electrophoretic mobility for the IL-2 K35E/Fc fusion monomer in SDS/PAGE of cell transfection supernatants (not observed for the non-mutated fusion protein) indicates higher expression of such mutated version as compared to its wt counterpart (Fig. 2a), which was confirmed by sandwich ELISA with specific antibodies to the IL-2 and Fc moieties (Fig. 2b). Noteworthy, the increase in the intensity of all the other bands coming from cell debris in IL-2 K35E/Fc-containing supernatants reflects a moderately higher growth of cultures expressing the mutated protein. Effect of K35E mutation on the secretion of IL-2-derived recombinant proteins by human cells. 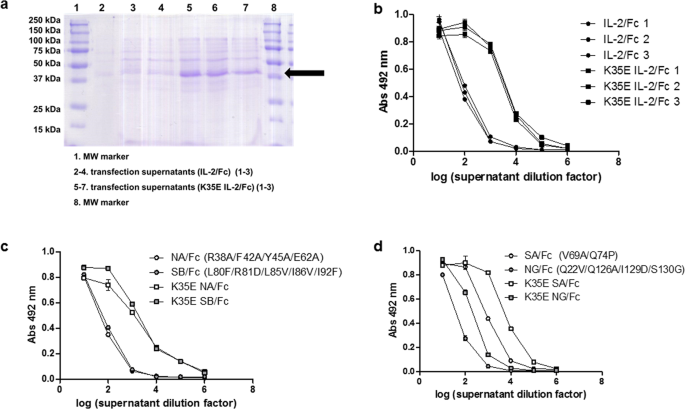 The presence of Fc-fused IL-2 (either non-mutated or containing K35E) in transiently transfected Expi293 supernatants was evaluated by SDS-PAGE under reducing conditions (a). Three independent transfections were performed for each protein variant to assess reproducibility. The arrow indicates the band corresponding to monomeric fusion protein. The result was confirmed by ELISA on microplates coated with the anti-IL-2 mAb IL-2.2 (b). Bound fusion proteins were detected with an anti-human Fc antibody conjugated to horseradish peroxidase. A similar comparison was done for fusion proteins containing four reported IL-2-derived muteins: an IL-2 receptor alpha subunit non-binder10 (NA, c), a beta subunit super-binder11 (SB, c) an alpha receptor super-binder29 (SA, d) and a gamma non-binder (NG, d). The ELISA evaluation of a single representative cell transfection experiment is shown in (c,d). Samples were evaluated by triplicate on ELISA plates. The average yield of protein A-affinity purified final product (calculated using seven independent cell transfection experiments) was 8.7 ± 2.2 mg of the recombinant protein from 1 L of culture for the non-mutated IL-2/Fc. This number increased to 92.7 ± 17.5 mg/L for its K35E counterpart. Table 1 shows the individual yields for each batch of purified protein. Characterization of the purified recombinant proteins by SDS/PAGE under non-reducing conditions showed the presence of a single band corresponding to the IL-2 K35E/Fc homodimer (Fig. 3). A similar major band was observed for the IL-2/Fc protein, but in this case it was always accompanied by lower mobility bands corresponding to denaturation-resistant large aggregates that disappeared in reducing conditions (data not shown) and were interpreted as a first indication of a change in the biophysical properties of K35E-mutated IL-2. Table 1 Yield (mg of Protein A-purified recombinant fusion protein from 1 L of culture). Purified recombinant fusion proteins (after transient Expi293 transfection, protein A affinity chromatography and desalting) were analysed by SDS/PAGE under non-reducing conditions. Five µg of protein were applied to each lane. Several independent batches of each protein were tested (IL-2/Fc in lanes 2–4 and K35E IL-2/Fc in lanes 5–8). Black arrow indicates the major band corresponding to the fusion protein homodimer. Grey arrows highlight the presence of denaturation-resistant aggregates with lower electrophoretic mobility in all samples of non-mutated IL-2/Fc. Secretion-enhancing effects were also shown for fusion proteins including four IL-2-derived muteins (Fig. 2c,d), despite their different basal expression levels, and were observed in different host cells (HEK293-6E and HEK293-T adapted to grow in suspension). Secretion was increased in the whole set of experiments ranging from three to 24-fold. As the secretion machineries of E. coli (used for phage display) and human cells are quite different, similar effects in both systems suggest that K35E is inducing an intrinsic change of IL-2 folding pathway and/or structure, which facilitates the secretion process. The aggregation propensity of the recombinant fusion proteins was finally investigated through size exclusion chromatography. The mutated K35E IL-2/Fc protein exhibited a much lower aggregation propensity than its non-mutated counterpart. While purified K35E IL-2/Fc predominantly exists as a homodimer (Fig. 4a) due to the presence of the dimerizing Fc moiety, IL-2/Fc tends to form higher molecular weight aggregates (Fig. 4b). This finding provided an initial clue to the mechanism behind the already observed secretion increase, as aggregation could compete with normal transit through the secretion pathway precluding high level production of recombinant proteins from transfected cells. Expression of an aggregation-prone recombinant protein can also compromise cell viability, contributing to the final effect through a decrease in the number of cells able to produce it. Differences between IL-2/Fc and K35E IL-2/Fc fusion proteins. The aggregation status of purified fusion proteins was compared by size exclusion chromatography (a,b). The elution profiles of three independent batches of K35E IL-2/Fc (a) and non-mutated IL-2/Fc (b) are shown. A standard comprising five molecules of known molecular weight (thyroglobulin 670 kDa, IgG 158 kDa, ovalbumin 44 kDa, myoglobin 17 kDa, vitamin B12 1.35 kDa) was used for calibration (overlapping between the elution profiles of samples and standards is shown in the inserts). The numbers indicate the relative areas (%) of the main peaks corresponding to homodimers and large aggregates respectively in each kind of sample. The antigenicity and receptor binding properties of IL-2/Fc and K35E IL-2/Fc were compared by ELISA (c) on microplates coated with several anti-IL-2 mAbs and CD25 (human/mouse). Bound proteins were detected with an anti-human Fc antibody conjugated to horseradish peroxidase. The ELISA evaluation of one batch of each fusion protein (both produced in parallel) is shown as a representative example. Samples were evaluated by triplicate in ELISA. The result was confirmed in independent ELISAs with the remaining two batches of each. 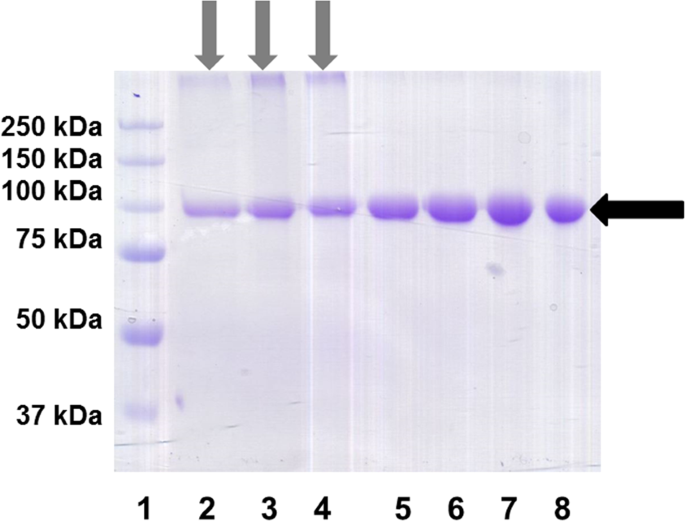 The ability of two batches of each fusion protein to induce the proliferation of the IL-2-dependent CTLL-2 cell line was evaluated (d), using the Alamar blue dye reduction as an indicator of cell proliferation. 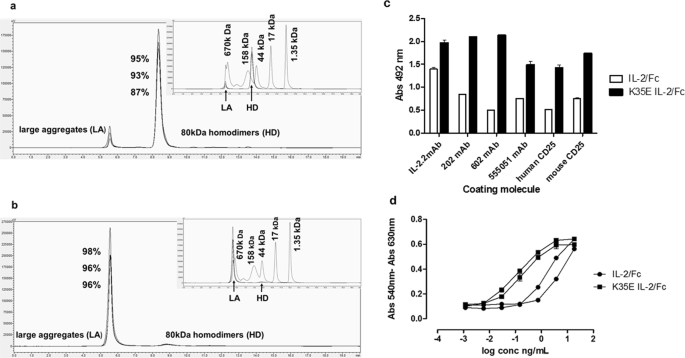 K35E IL-2/Fc homodimers kept IL-2 antigenicity and receptor binding properties, as shown by recognition by four anti-IL-2 mAbs and human/mouse CD25 (Fig. 4c). K35E IL-2/Fc was always more reactive than the original IL-2/Fc, indicating that K35E replacement gives rise to a protein that reproduces the global structure of natural IL-2 to a greater extent than its non-mutated recombinant counterpart. Heavy aggregation of the latter can hide IL-2 epitopes, explaining the diminished reactivity towards both antibodies and receptors. These findings resemble the results with the phage-displayed mutated protein (see above). K35E IL-2/Fc also induced proliferation of the IL-2-dependent CTLL-2 cell line in vitro (Fig. 4d), showing compatibility of K35E with cell signalling. The specific activity of twelve batches of K35E IL-2/Fc was in the expected range (2.15 × 106 to 1.4 × 107 IU/mg) in that assay, which is the standard technique to quantitate the biological activity of the cytokine33. The aggregation status of the non-mutated IL-2/Fc was reflected in a lower specific activity (1.2–5 × 105 IU/mg), confirming the higher quality of the mutated version. Even though the higher receptor binding ability and biological activity of the mutated protein could be interpreted as the result of a specific increase in the affinity to CD25 (the selector target used for the initial screening), two observations argue against this alternative explanation: i) the proximity of the positively charged group of K35 to the negatively charged E1 of CD25 in the cytokine/receptor complex4 that makes it very unlikely an affinity improvement due to the replacement K35E, and ii) the general enhancing effect of K35E on binding to other molecules like antibodies recognizing a plethora of different IL-2 epitopes (not used for phage selection). The large differences between the aggregation status of wt and mutated IL-2-containing fusion proteins has precluded a strict comparison of their binding affinities to definitely rule out a contribution of intrinsic receptor affinity. A hypothesis to explain the observed differences was generated from in silico molecular dynamics (MD) simulations of the wt and K35E variants. 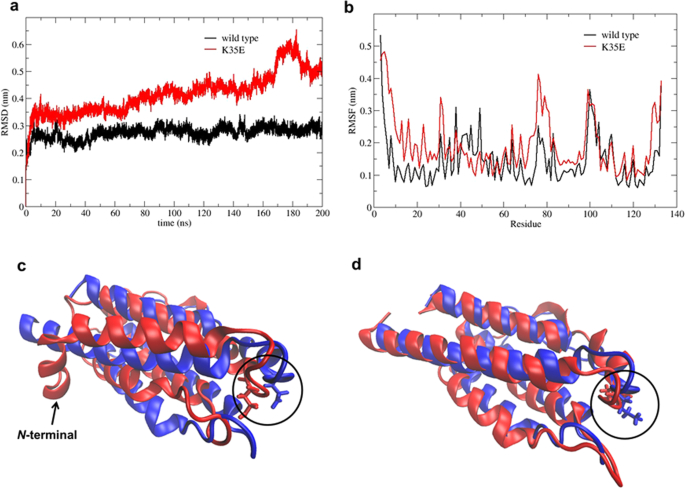 Whereas stable RMSD values below 0.3 nm were observed for wt IL-2, the time profile of the RMSD values calculated for heavy atoms of the mutated protein with respect to the initial structure (>0.4 nm) indicated the occurrence of conformational changes over the simulation (Fig. 5a). The flexibility differences between both proteins were dissected by calculating the root means square fluctuation (RMSF) per residue. The N-terminal segment of the mutated protein showed more structure fluctuation compared to the wt (Fig. 5b). The structural superposition of the initial and final structures of the K35E variant simulation showed a distinctive bend in the N-terminal helix (Fig. 5c) not observed for non-mutated IL-2 (Fig. 5d), indicating a long-distance effect of the mutation on the IL-2 structure. In silico study of the impact of K35E over the structural stability of human IL-2. Root mean square deviation (RMSD) of heavy atoms of IL-2 (black line) and K35E variant (red line) over a 200 ns molecular dynamics (MD) simulation are shown in (a). Root mean square fluctuation (RMSF) per residue along the primary sequence of IL-2 (black line) and K35E variant (red line) are shown in (b). Panels c and d show the structural superposition of the initial (0 ns, blue) and final (200 ns, red) structures from the MD simulations using the mutated and non-mutated proteins respectively. The arrow indicates the bending on the N-terminal segment in the K35E-containing variant, while the circle encloses the replacement at position 35. Calculation of the difference in the folding free energy between the mutated and the wt protein (ΔΔGfolding = ΔG folding wt − ΔG folding K35E) according to the thermodynamic cycle shown in Supplementary Fig. S2 rendered a positive ΔΔGfolding value (17.49 kcal/mol), indicating that K35E behaves as a stabilizing mutation. Solubility was also studied in silico, through calculation of the difference in the solvation free energy of the folded state of the mutated versus the wt protein (ΔGsolvation = Gsolvation wt − Gsolvation K35E). A positive ΔGsolvation value (23.94 kcal/mol) was consistent with the lower aggregation propensity of the mutated protein. The limited availability and high aggregation-propensity of non-mutated IL-2-containing fusion proteins have hampered verification of the structural and biophysical effects of K35E up to now. Only experimental studies could confirm the individual contribution of flexibility, conformational changes and thermal stability to the improved secretion of the mutated products. The low yields of non-mutated IL-2/Fc, together with its lower specific activity compared to the K35E-containing version, precluded a direct comparison between both molecules in an in vivo scenario. Using equal masses of them would give a strong advantage to the more active mutated product, while pairing the amounts to reach the same levels of biological activity (according to the above described CTLL-2 proliferation assay that is commonly used for that purpose), would have required large quantities of the non-mutated less active product. Production of such amounts was not affordable due to the intrinsic low yields of this protein. The different aggregation status of both proteins (see above) would complicate further any comparison of in vivo behaviour. Therefore, our analysis of the in vivo function of K35E IL-2/Fc in C57/BL6 mice was only aimed at determining whether the mutated highly secreted product exhibits the pleiotropic functions already described for Il-2 or not. K35E IL-2/Fc was strongly immunostimulatory in vivo, as judged by the enlargement of the mice spleens (Fig. 6a,b). This effect was associated to the expansion of both CD44hi memory-phenotype CD8+ T cells (Fig. 6c,d) and the highly suppressive ICOS+ subpopulation of CD4 + CD25 + Foxp3 + Tregs34 (Fig. 6e,f). These results showed the compatibility of K35E with the dual biological roles of IL-2 within the immune system, promoting both effector and regulatory functions. 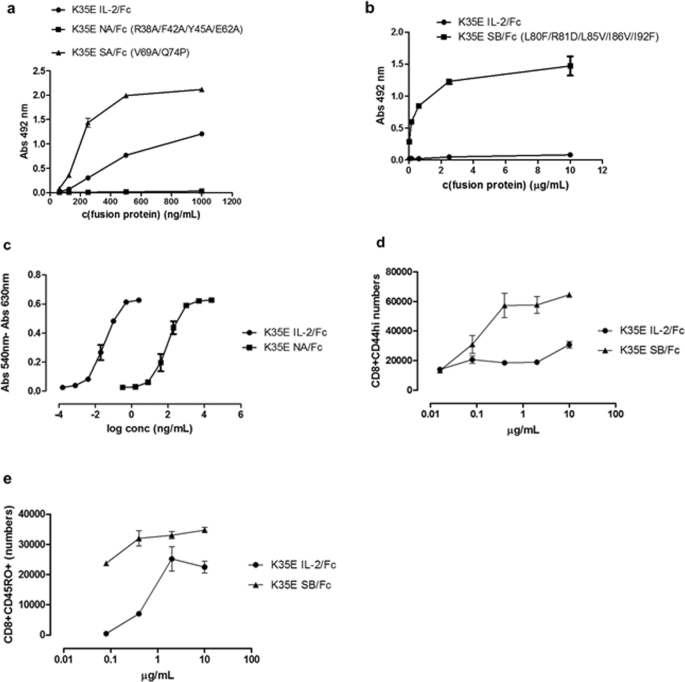 The enhancement of immune responsiveness induced by K35E IL-2/Fc translated into a strong anti-metastatic effect in a mouse model of experimental lung metastasis after injection of MB16F0 melanoma cells (Fig. 6g,h). In vivo functional characterization of K35E IL-2/Fc protein. C57/BL6 mice received five daily injections of either rhIL-2 or K35E IL-2/Fc (4 × 104 IU) and were sacrificed on day 7. Control mice were injected with PBS. Spleen enlargement is shown in the picture (a) and spleen weights are represented in (b). The expansion of memory phenotype CD8 + CD44hiCD122+ lymphocytes (c,d) and Treg CD4 + CD25 + Foxp3 + ICOS + population (e,f) in the spleens of treated mice was assessed by flow cytometry. The antimetastatic effect was evaluated 21 days after the inoculation of MB16F0 melanoma cells, followed by the above described treatments (with rhIL-2, K35E IL-2/Fc or PBS). Representative lungs are shown in (g), and the lung weights of the whole set of animals are represented in (h). Lines represent mean and standard deviation within each group. Asterisks stand for statistical significance (*p < 0.05, **p < 0.01). Bonferroni test was used for multiple comparisons. All the experiments were performed twice. Recombinant human IL-2 (rhIL-2, 15 kDa) produced in E. coli and refolded in vitro was included in all the in vivo experiments as an additional control because it is a well-characterized protein commonly used in our laboratory for this kind of experiment and known to have anti-tumor activity10, but its effects are not directly comparable to the ones exerted by the fusion protein. The latter has a longer half-life due to its higher molecular weight (80 kDa) and the presence of an Fc moiety able to recirculate through binding to the neonatal Fc receptor. Such a difference explains the more pronounced effects of K35E IL-2/Fc in the in vivo scenario, where persistence of the stimulation is a critical factor. The whole set of in vivo experiments showed that the introduction of K35E is compatible with immunostimulatory and anti-tumor activity of IL-2-derived molecules. The addition of K35E did not impair the effects of sets of mutations aimed at increasing IL-2 reactivity to either alpha32 or beta11 receptor subunits or selectively disrupting the interaction with the alpha subunit10 (Fig. 7a,b). The unique functional properties of two of these variants (the alpha non-binder called no-alpha (NA) and the beta super-binder H9 (named here SB) were preserved after the introduction of K35E in the Fc-fusion format. K35E NA/Fc ability to stimulate CTLL-2 cells having the high affinity trimeric IL-2R was severely reduced (by more than two orders of magnitude) compared to K35E IL-2/Fc (Fig. 7c). While the specific activity of the latter was in the 106–107 IU/mg range as previously described, biological activity of K35E NA/Fc only reached 1–6 × 104 IU/mg, reflecting the strong influence of alpha subunit binding and recapitulating previous findings with the NA molecule produced in E. coli10. Compatibility between K35E and other mutations aimed at selectively modulating IL-2 interactions with IL-2R subunits. Binding properties of different Fc-fusion proteins were evaluated by ELISA on microplates coated with either human CD25 (a) or human CD122 (b). In the first experiment (a) fusion proteins containing IL-2, an alpha non-binder mutated variant10 (NA), or the alpha super-binder named here SA32 (all having the additional K35E replacement) were compared. A comparison between fusion proteins containing IL-2 and the beta subunit super-binder SB11 (both including K35E) was performed in the second experiment (b). Bound proteins were detected with an anti-human Fc antibody conjugated to horseradish peroxidase. ELISA experiments were repeated three times with independent batches of each recombinant protein. The results of the evaluation of one batch of each one are shown as a representative example. Samples were evaluated by triplicate in ELISA. K35E NA/Fc exhibited decreased ability to induce the proliferation of IL-2-dependent CTLL-2 cells as compared to its K35E IL-2 counterpart, as determined with an Alamar blue-based colorimetric assay (c). K35E SB/Fc showed an increased capacity to expand memory phenotype CD8+ T lymphocytes of both mouse (d) and human (e) origin in vitro. 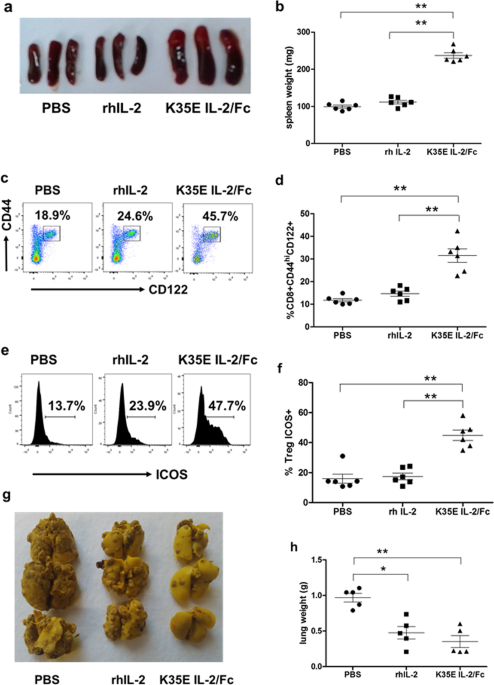 On the other hand, K35E SB/Fc was a strong super agonist overstimulating the expansion of memory phenotype CD8 + CD44hi T cells in cultures of purified mouse CD8+ T cells (Fig. 7d), as well as the in vitro expansion of human CD8 + CD45R0 + T cells (human memory phenotype) (Fig. 7e). This reflected the intrinsic advantage of the SB variant having increased affinity to the IL-2R beta subunit to stimulate effector cells harbouring the dimeric beta/gamma receptor11.